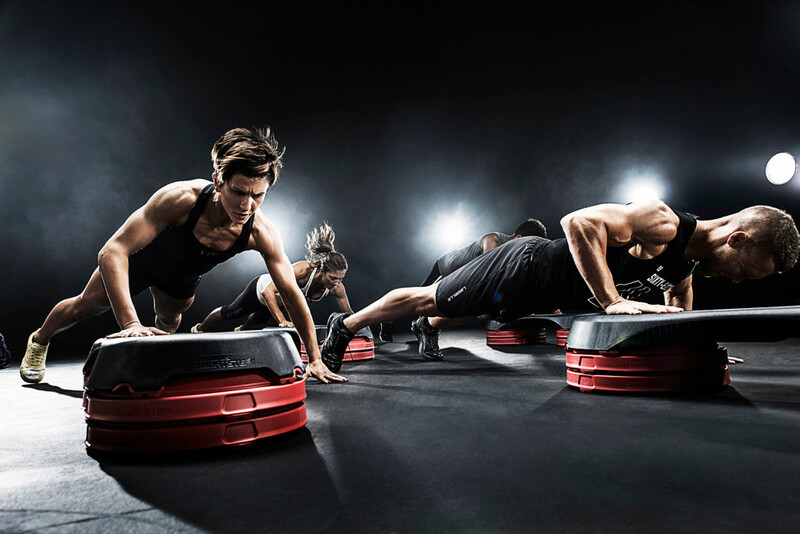 Cross training workouts are gaining wide acceptance and popularity for their flexible nature, ease of use, exciting caliber of training, and terrific results. Let’s design some cross training workouts for the serious bodybuilder! You’ll see dramatic gains in muscle mass and size, core and movement specific strength, overall power, posterior chain strength, core stability and of course, for all you wannabe cage fighters, combative mobility! And above all, you’ll be trying something NEW. We all know that the most effective workout is the one you’re not currently doing. So it’s time for you to give cross training a try! Cross training is designed to keep your body guessing. You’ll never know what is coming next, so the muscle confusion principle will kick in. You will grow because you’re training outside of your normal training procedure. Your system simple will not see it coming! Choose the top 10 or 15 exercises for building muscle that you enjoy. Then select the 5 kinds of cardiovascular training that suit your body type, available equipment, and fat-loss response best. Then mix them all in a blender for a 25 minute workout that will leave you exhausted, relieved (that it’s over!) and in a state of muscular stimulation and eventually, growth! Your individualized cross training workout should be tailored to match your available equipment and your own goals. If you train at a commercial gym, all of the equipment in the world might be right in front of you. However, you will also have to contend with sharing said equipment with other gym patrons. Training in the middle of the day or late at night might eliminate some of this problem, seeing as you’ll have fewer people in the area requiring your equipment! If you possess adequate equipment to train at home, then you’ve already got a major leg up on the competition! Train harder than ever in the confines of your own garage, and worry about sharing your equipment with no one! Next, let’s address your goals. Are you looking to add muscle mass to your frame? If so, then the exercises which populate your cross training workouts should be of the heavy, compound variety. These would include bench press (chest), deadlifts and barbell rows (back), squats (legs), dumbbell work (shoulders and back), biceps curls and triceps dips (upper arms), and heavy dumbbell pressing (shoulders and triceps). You will also want to toss in a few abdominal exercises and core/stability strength movements if you are familiar with them. Certain weaknesses should be address when planning your own cross training workouts. Do you have great arms, but poor legs? if so, then you would serve yourself best to bump up the number of lower body movements, and keep your upper body movements aimed at maintaining your current level of mass. you will never have the best of everything when it comes to your physique, but you do possess the ability to target and isolate weaker body parts and give them extra attention – even in the midst of a full body cross training workout! Are there warnings that should be heeded when training in this manner? Of course! If you have a bad ticker (personal or family history of heart problems), then training to both aerobic and anaerobic failure concurrently may not be in your best interest, right? If you are nursing a shoulder or knee injury, hitting the full body from every angle like this may subject your weakest link to some seriously unnecessary stress and risk! Don’t try to re-invent any wheel when planning your own cross training workouts. Toss in 2-3 sets for all the major muscle groups, along with 1-2 sets for each of the smaller groups. Include a cardio set with every third set. Start slow. Realize that the first few workouts in this manner may leave you stressed, exhausted and overwhelmed. Perhaps you will fail at hitting every muscle group with the kind of intensity that you had hoped for. But that’s okay! Regroup after each cross training workout, and plant he next day’s routine (48 hours later) to increase intensity in some areas you believed were lacking during the previous workout. Instead of following some cookie-cutter training routine, you now have the tools to design your very own cross training workout. Stick with the movements you prefer and are available to you. Train heavy and hard, and give your lungs as much of a workout as your muscles are seeing! Cross training is your chance to hit your entire body, from both an aerobic (cardiovascular exercise) and anaerobic (weight training) approach! You can then rest for 1-2 complete days without worrying about overtaxing your central nervous system. No matter what your goal may be, cross training workouts will give your system an overall level of muscle mass and strength that isn’t provided with most other workout protocols.